Travel back in time to the age of Vikings and head on a noble quest for Click here to play! BEER! If you can help the Vikings secure a treasure trove of this golden ale, you'll be taking home plenty of valuable treasures of your own! As beer is what these mighty men want, beer is what you'll need to spin. Capture as many beer tankards as possible as these full mugs are wild symbols. They will replace most other symbols to help you spin in even more wins. Stick close to the Viking as this brawny brunette will lead you in your quest for cash by bringing in up to 2500 times your line bet if you can spin two to five across an active pay line. Also watch out for long boats as these sea fairing vessels will get up to 1000 times your line bet. Also helping you in your quest are barrels and Viking helmets. Of course you can't have a quest for beer without a few beer wenches to help serve up the frothy drink. Spin two to more scattered wenches anywhere on the board to multiply your total bet. Three or more will trigger a bonus feature that could see you taking home a few bonus prizes! 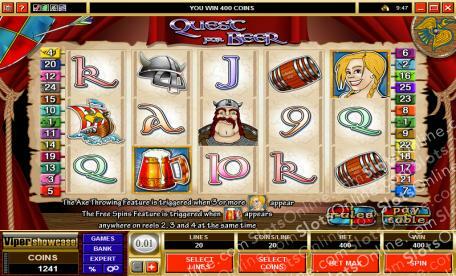 So, don the armor and hoist a glass because it's time to take a quest for beer and plenty of cash! The blond beer wench acts as a scatter. Spin two or more anywhere on the board to multiply your total bet by 1, 5, 20, 100 respectively. Three or more anywhere on the board will trigger a bonus feature. The brimming beer tankards are a substitute. They will replace all other symbols (except scatters) to help you bring in more wins. If you spin them anywhere on reels 2, 3, and 4 at the same time, you will trigger a free spin feature. If you can spin three or more beer wenches anywhere on the board, you will trigger the Axe Throwing feature. You will get to throw three axes at kegs full of beer. A prize is awarded every time you hit a keg and the tankard below it gets filled. The game stops when all axes have been thrown or you hit a keg with no beer in it.